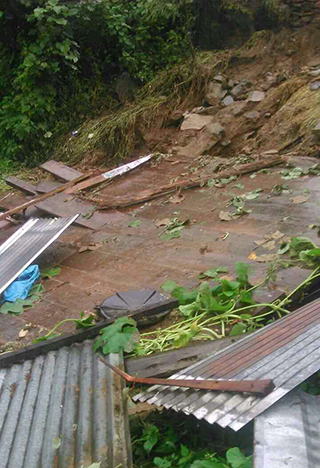 A landslide in Trongsa damaged two huts yesterday evening. 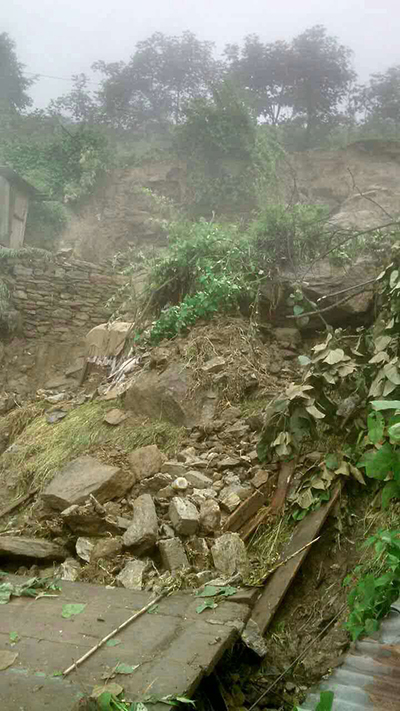 The landslide, triggered by continuous rain in the past few days, occurred at Lawshong, a few hundred meters away from Trongsa town towards Thimphu. The three occupants escaped unhurt. While one of the occupants could retrieve most of the belongings, the others lost it all. They are currently housed at their neighbour’s house. On behalf of His Majesty the King, the kidu office in Trongsa handed over Nu 10,000 each to the affected. The rainfall has also damaged 20-meter stretch of Trongsa-Zhemgang Highway. Department of Roads’ Chief Engineer, Taugay Choedup said it could take several weeks to repair the road. He said because of the damage, heavy vehicles, ferrying construction materials, cannot ply. About 10 meters of Thruepang Palace’s boundary wall has also been damaged.